excipients: benzyl alcohol, water for injection. Vitamin B-Complex is a sterile solution for intramuscular or slow intravenous injection comprised of vitamins, which may be categorized as belonging to the vitamin B complex group and dexpanthenol, comprising a group of water-soluble factors more or less closely associated in their natural occurrence. Each vitamin of the B-complex forms part of a co-enzyme essential for the metabolism of protein, carbohydrate or fatty acid. Dexpanthenol is converted in the body to pantothenic acid or calcium pantothenate. Pantothenic acid (vitamin B5) is a component of coenzyme A (CoA), essential to the metabolism of carbohydrates, proteins, and fats, as well as for the synthesis of hormones and cholesterol. Absorption, distribution. Vitamins widely distributed to most body tissues. Metabolism. Riboflavine is bound to plasma proteins. Thiamine is fundamentally associated with carbohydrate metabolism. By combining with the pyrophosphoric acid in nucleated cells, particularly in the liver, kidneys and white blood cells it is converted in the body to its pyrophosphate which acts as coenzyme in decarboxylation of alpha-keto acids reactions, particularly of pyruvate and alpha-keto-glutarate. Deficiency of thiamine can lead to pyruvic and lactic acids accumulation in the tissues. Nicotinamide is readily absorbed and widely distributed in the body tissues. Riboflavine is bound to plasma proteins. Although widely distributed, little is stored in the body, and amounts in excess of requirements are excreted in the urine. Elimination Pyridoxine is excreted in the urine as 4-pyridoxic acid. A little is stored in liver and kidneys, and amounts in excess of the body’s requirements are excreted in the urine. Small amounts of nicotinamide are excreted unchanged in urine, excreted amount is increased with large doses. Thiamine is not stored to any appreciable extent in the body and amounts in excess of requirements are excreted in the urine as unchanged thiamine or metabolites. For vitamin deficiency, which states prolonged or wasting diseases, after acute infections, post-operatively and in psychiatric states, the heart manifestations of beriberi, the skin manifestations of pellagra, corneal vascularisation and polyneuritis,thiamine deficiency, characterised by lactic acidosis and neurological deterioration. 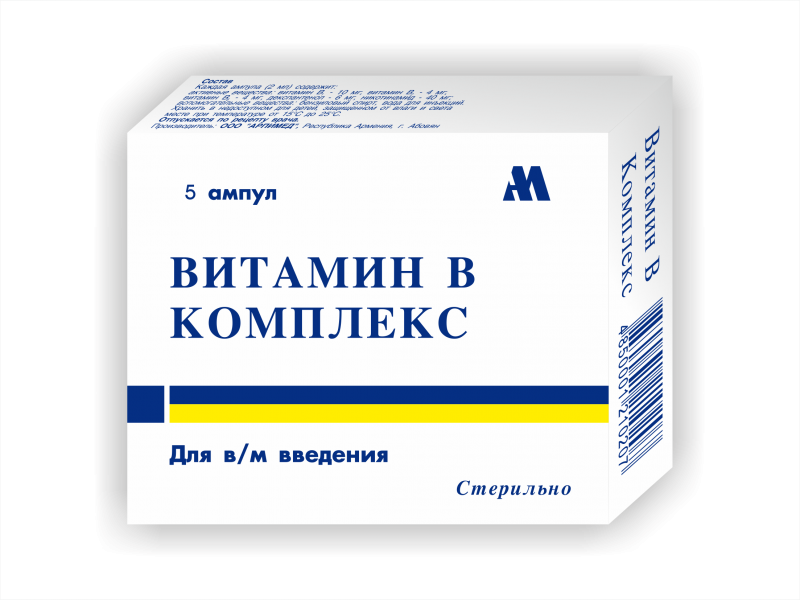 – clinical and sub-clinical vitamin В1, В2, B5,В6 and nicotimnmide deficiency. – Physical and mental exhaustion , appetite and sleep disturbances, recovery after severe illness. – As a component for complex therapy in stress conditions, liver illness, diabet mellitus , fractures, burns, accute infections, atherosclerosis, slow recovering wounds and ulcers, nervous system disease (radiculitis, nevritis, neuralgia), perypheric neuropathia. Vitamin B complex injection is usually well tolerated. It must be injected slowly. A therapeutic dose of 1 to 2 mL daily is recommended by intramuscular or slow intravenous injection (over 10 minutes). One or twice daily for up to 7 days . The contents of one ampoule are drawn up into a syringe to mix them just before use, then injected slowly high into the gluteal muscle, 5cm below the iliac crest. Children: rarely indicated for administration to children . Sensitivity to the listed ingredients may occur, very rare case of anaphylactic shock (thyamin) Blood preassure reduction (Nicotinamide). Long term use can cause severe perypheric neuropatia development (Pyridoxine). The usual precautions for parenteral administration should be observed. Do not inject if precipitation occurs. Inject slowly by the intravenous route. High concentrations should be diluted using normal saline injection, when given intravenously. – Sensitivity to the ingredients listed. Excess vitamin B is readily excreted, therefore no serious problems are anticipated for the administration of vitamin B in this form. The usual precautions should be observed when administering drugs during pregnancy, especially in the first trimester. In high doses, pyridoxine may interfere with prolactin release and should only be used with caution in nursing mothers. Lactation: In the limited studies so far available, vitamins can appear in breast milk in very low concentrations and should, if possible, be avoided when breastfeeding. Pyridoxine may increase the peripheral metabolism of levodopa, reducing therapeutic efficacy of the latter drug. Therefore, patients with Parkinson’s disease, who are receiving treatment with plain levodopa should not take vitamin B6 in doses which greatly exceed the daily requirement. This does not apply when levodopa is combined with a peripheral decarboxylase inhibitor. Solution for i/m injection (2 ml) in ampoules, 5 ampoules in container, 2 containers in cardboard box with insert leaflet.